Violent attack on two Jews in northwestern Turkey underscores fears for country's Jewish minority. Even amid reports that Israel and Turkey are close to "normalizing" relations again, it appears that the long-term impact of years of anti-Israel and anti-Semitic incitement since the souring of relations in 2010 will be far more difficult to roll back. Arutz Sheva has seen an email by a Turkish Jewish businessman, relating a harrowing anti-Semitic attack on him and his partner in the northwestern Turkish town of Babaeski, in the country's Marmara district, once again highlighting fears for the future of Turkey's 15,000-strong Jewish minority. The two men - who requested anonymity - were visiting clients in the Thrace Region, when they stopped off in the town for a lunch break. But upon making their orders at a local restaurant, they were in for a nasty shock. "We gave our orders at a fish restaurant, but the owner of the restaurant realized that we are Jewish," the email related. "After he made it clear that he won’t serve food to Jews, he started to insult Jews, the Jewish religion. He finally lost his control and marched over two of us with a dangerous tool." 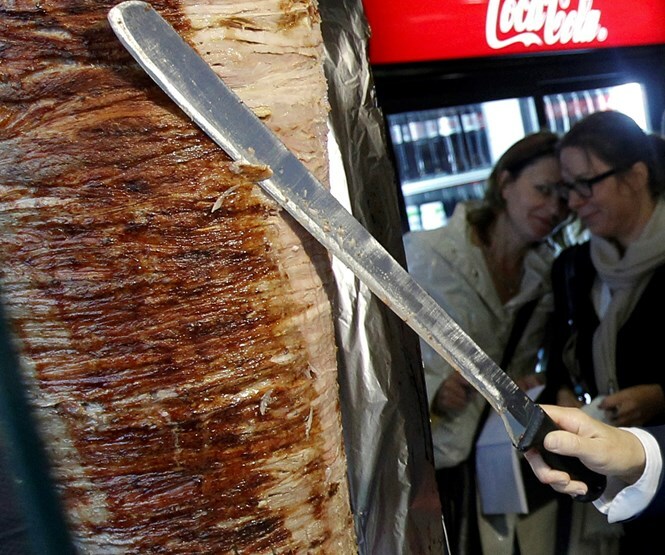 Arutz Sheva has learned from a friend of the victim that the "tool" in question was in fact a doner blade - a large, sword-like implement for cutting meat. He said passersby did nothing to intervene. Faced with such sudden and extreme violence, the two men had little choice but to flee. "We could not defend ourselves at all, we just ran away from this anti-Semitic man. We ran for our lives. Experiencing an event like that affected us so much." He said he felt a duty to share story with others, and said he and his partner were lucky to make it out in one piece. "Thank God we are safe at home now," he said. Blatantly anti-Semitic statements by Turkish leaders have become almost routine since Israel-Turkey relations soured in 2010; from the country's Deputy Prime Minister accusing a dark conspiracy by "Diaspora Jewry" of being behind the popular "Gezi Park" anti-government protest movement, to similar comments made by Prime Minister Erdogan himself. The Turkish Prime Minister has a particularly long history of anti-Semitism. Prior to his stint as PM, in 1998 Erdogan - then mayor of Istanbul - infamously declared that "the Jews have begun to crush the Muslims in Palestine, in the name of Zionism. Today, the image of the Jews is no different than that of the Nazis." And those anti-Semitic sentiments are filtering down into society, where they have clearly found fertile ground, not least among the Islamist support-base of Erdogan's AKP party. In October of last year, a Turkish newspaper revealed how young Jews were flocking to leave the country over rising anti-Semitism. Just two months later, pro-Erdogan demonstrators attacked a woman in Istanbul whilst shouting "are you Jewish?" The same period saw two incidents in which Turkish students were arrested at the sites of Nazi death camps in Poland for giving Nazi salutes. Describing the atmosphere for Jews within Turkey, one recent emigre told Arutz Sheva that many Jews were leaving Turkey out of sheer "desperation." "They were like, 'let's go before it's too late,'" he related, saying that the number one destination for emigres was Israel, followed by the United States.